Half-Mile Farm is a charming country inn surrounded by nature on the outskirts of Highlands, North Carolina. Boasting all the luxury comforts typical of an Old Edwards property, Half-Mile Farm promises an unforgettable stay. Overlooking the glistening Apple Lake, the adults-only Lodge offers luxurious accommodations in the form of cozy log cabins with country-style décor and modern amenities. Special touches such as a genteel, gourmet breakfast each morning and complimentary hors d'oeuvres and drinks in the evening add a charming touch. Surrounded by 14 acres of fields, forests, streams and a beautiful lake, Half-Mile Farm has something for everyone, from relaxing with a book and soaking up the serenity, exploring the area by hiking or biking, or enjoying a paddle on the lake. Half-Mile Farm offers beautifully-appointed guest rooms with lovely views of the courtyard or gardens and modern conveniences. Guest room amenities include HDTVs with satellite channels, DVD players, telephones with voicemail and data ports, and complimentary wireless Internet. Guest rooms are located in the historic Main Inn house or in separate cabins for extra levels of privacy and space. Located in the historic Main Inn house, Historic Standard Queen rooms feature queen-size beds with plush linens, private en-suite bathrooms with showers and deluxe bath products and charming courtyard views. Historic Deluxe King rooms are also located in the Main Inn house and feature king-size beds in plush linens, and private en-suite bathrooms with separate showers, Jacuzzi tubs, and deluxe bath products. These rooms boast beautiful views of Apple Lake. Historic Balcony Queen rooms are located in the historic Main Inn house and have queen-size beds in plush linens, and private en-suite bathrooms with separate showers, Jacuzzi tubs, and deluxe bath products. These rooms have their own private balconies which overlook the gardens and the lake. Located in the Courtyard, Courtyard Standard King Fireplace, and Courtyard Balcony King Fireplace rooms offer extra levels of luxury with king-size beds in plush linens, and private en-suite bathrooms with separate showers, Jacuzzi tubs, and deluxe bath products. Separate sitting areas are spacious and light and feature large stone fireplaces, comfortable furnishings and private balconies with gorgeous views. Courtyard Standard King Porch rooms are also located in the courtyard and feature king-size beds in plush linens and private en-suite bathrooms with showers and deluxe bath products. These rooms have private decks that look out over the farm. Courtyard Luxury King Balcony Fireplace rooms are refined and charming with king-size beds in plush linens, and private en-suite bathrooms with separate showers, Jacuzzi tubs, and deluxe bath products. Separate sitting areas are spacious and light and feature large stone fireplaces, comfortable furnishings and private balconies with gorgeous views. Located on the second floor of the Earnest Cabin Suite, the Elizabeth Room features a king-size bed with plush linens, and a private en-suite bathroom with separate shower, Jacuzzi tub, and deluxe bath products. The spacious suite offers a fully equipped kitchenette and dining area and has a lovely view over the farm. The two-story Justice Cabin Suite is situated next to the Earnest Cabin Suite and offers a king-size bed with plush linens, and a private en-suite bathroom with separate shower, Jacuzzi tub, and deluxe bath products. The spacious suite offers a fully equipped kitchenette and dining area and has a large stone fireplace in the sitting area. Built to reflect the early houses of the Valley of Virginia, the Earnest Cabin Suite is a cozy log and stone building with separate bedrooms and living areas. The bedroom features a king-size bed with luxurious linens and a roaring fireplace, and a private en-suite bathroom with walk-in shower, Jacuzzi tub, and deluxe bath products. A fully equipped kitchen and charming dining area are ideal for entertaining. The Earnest Two and Three Bedroom suites are a combination of The Earnest Cabin Suite with the Elizabeth Room or Justice Cabin Suite to create a two- or three-bedroom getaway for couple’s traveling together. Two/three separate bedrooms feature king-size beds with luxurious linens and roaring fireplaces, and two/three private en-suite bathrooms have walk-in showers, Jacuzzi tubs, and deluxe bath products. A joint living area has a dining table and chairs and a large fireplace, and a full kitchen is perfect for preparing meals. Located next to the Tavern Cabin Suite with an outdoor entrance, the Blacksmith Cabin Room has a king-size bed with luxurious linens and a roaring woodstove fireplace, and a private en-suite bathroom with walk-in shower, Jacuzzi tub, and deluxe bath products. A fully equipped kitchen and charming dining area are ideal for entertaining and a covered porch perfect for relaxing. 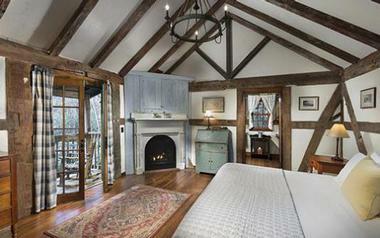 The Tavern Cabin Suite is the farm’s most luxurious and spacious cabin with separate bedrooms and living areas. A king bedroom features a king-size bed with beautiful linens, a sunny sitting area, and a stone fireplace, along with a private en-suite bathroom with walk-in shower, Jacuzzi tub, and deluxe bath products. A comfortable living area has a fireplace and dining area with table and chairs, and a fully equipped kitchen has everything needed for easy holiday living. An expansive covered porch and outdoor dining area has a wood stove fireplace and is ideal for alfresco dining under the stars. These Tavern Cabin Suites are also available in two- and three-bedroom configurations. The Lamons and the Fish Rooms offer king-size beds in plush linens, and private en-suite bathrooms with showers, Jacuzzi tubs, and deluxe bath products, as well as stone fireplaces and kitchenettes. The Captain Suite features a king-size bed with plush linens, and private en-suite bathroom with walk-in shower, Jacuzzi tub and deluxe bath product, as well as a stone fireplace, fully equipped kitchen and covered porch with views of the lake. Guests can enjoy a hearty, gourmet breakfast, freshly prepared and served every morning in the sunny breakfast room. Afternoon and early evenings offer complimentary hors d'oeuvres and wine in an elegant setting. 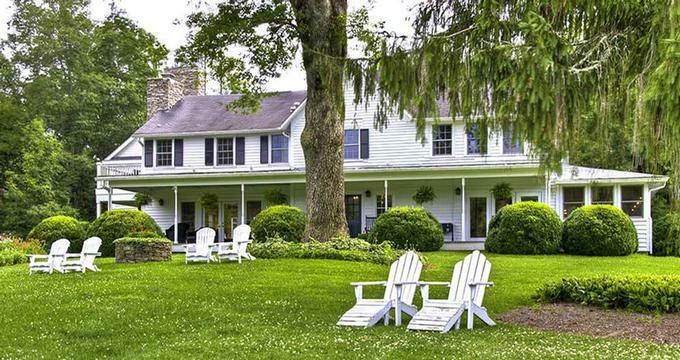 Nestled amongst acres of verdant fields, forests, and streams, Half-Mile Farm offers an array of activities to enjoy, from paddling on the six-acre lake to relaxing in the gorgeous gardens. A heated mineral swimming pool offers cool respite in the summer, and broad porches, patios and decks around the property are ideal for kicking back and soaking up the views. Other activities in the area include hiking, mountain biking and canoeing on the lake, and the nearby Old Edwards Inn and Spa has a fitness center and spa.